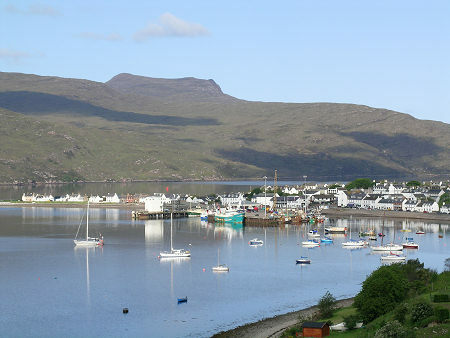 However you approach it, Ullapool comes as a surprise. From the south east you round a bend in the road and there it is, laid out across a bay in the side of Loch Broom. From the north, you crest a rise and, if your attention isn't still held by An Teallach to the south, you suddenly see Ullapool below you. 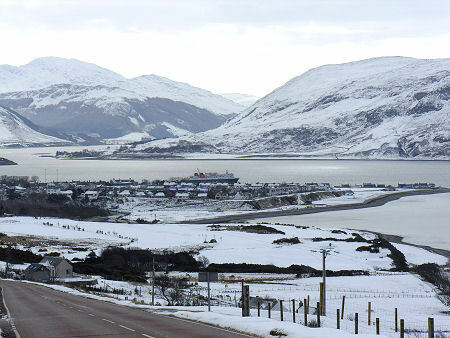 Whatever the weather, you are immediately struck by Ullapool's whiteness and by its regularity of design and layout. This is a legacy of the town's origins, being designed and built in 1788 by Thomas Telford and the British Fisheries Society. 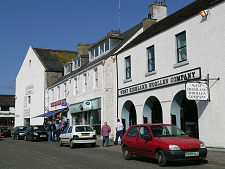 Since then, though the fortunes of the Scottish fishing fleet have ebbed and flowed, fishing has remained at the heart of the economy of the town. 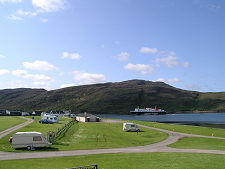 From the late 1970s, during the height of the Cold War, Loch Broom became the base for up to 60 Russian and East European "Klondykers" between August and January each year. 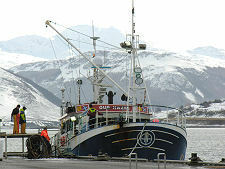 These were factory ships whose role was to process mackerel caught by smaller fishing boats, with the product being transferred to refrigerated vessels for return to home markets. 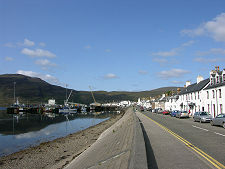 The Klondykers are no longer a feature of Loch Broom, but for many years their crews added a very cosmopolitan air to Ullapool's streets. 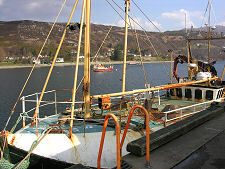 Today Ullapool remains home to a number of more locally based fishing boats. 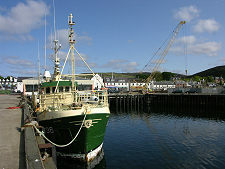 The town is also the terminus for the ferry to Stornoway, so the MV Loch Seaforth is a frequent visitor. 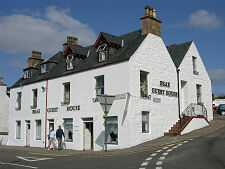 The ferry offices are in the attractive ferry terminal on the pier, while the vehicle waiting area lies right in the heart of the town opposite the ferry berth. In 2009 the ferry began to operate seven days per week: until then there had been no Sunday service. Another regular caller is the small cruise ship Hebridean Princess. 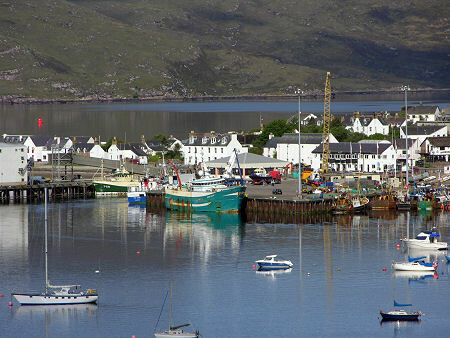 As a base for exploring the north west of Scotland, Ullapool is ideal. It has accommodation to suit all tastes and pockets, including one of the best (and best located) campsites in this part of Scotland. And since the upgrading of most of the roads further north it is within reasonable reach of many parts of the region that twenty-five years ago would have needed a major expedition to get to. 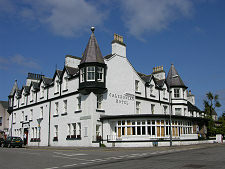 It is also a significant waypoint on the North Coast 500 long distance drive. For those wanting to know more about the area the excellent Ullapool Museum & Visitor Centre on West Argyle Street can be highly recommended. 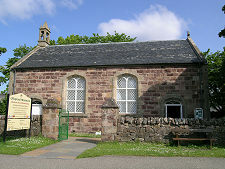 This is in the old parish church, and tells the story of the people of Loch Broom and the history of Ullapool. 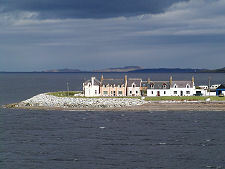 Finally, Ullapool boasts a coastal golf course.